На данном уроке мы сравним употребление времен, используемых для выражения прошедшего времени, – простого прошедшего (Past Simple), длительного прошедшего (Past Continuous), совершенного прошедшего (Past Perfect) и совершенного настоящего (Present Perfect). There are three principal past tenses used to make general statements about the past (рис. 1): Past Simple, Past Continuous, and Past Perfect. Соедините следующие предложения с описанием времени. 1. I went into the flat. 2. His brother always kept a key under the mat because once he had lost his key. 3. I was watching the cartoons when my sister came home. a) When one action interrupts another action, we use the Past Continuous for the longer action. b) We use the Past Simple for one completed action. c) If it is unclear which of two actions happened first, we use the Past Perfect for the earlier action. Соедините начало предложения с его окончанием. a) my bus went past and I missed it. b) when you phoned me. c) while I was reading in bed. d) the sun was shining through the window. e) I was practicing my guitar. f) when I found this photo of my grandfather. g) while I was playing football. At six o’clock in the morning, the telephone rang. I ran down the stairs. While I was running down the stairs, I fell over the cat. When I reached the bottom of the stairs, the phone had stopped ringing. But the noise had woken my baby brother, and he was crying. I was talking to him when the phone started ringing again! I walked down the stairs carefully. When I answered the phone, it was my friend Bob. I had completely forgotten that we had agreed to go fishing! We can use the Past Simple to talk about actions and states which we see as completed in the past. I left school when I was sixteen. He told me all about his childhood. 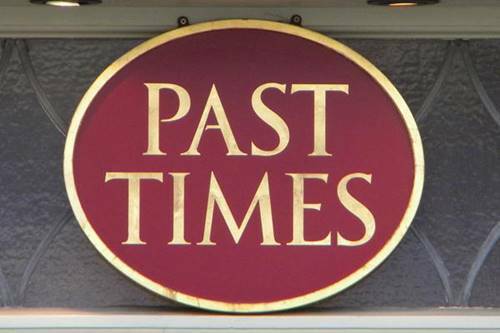 We can use the Past Continuous to talk about past events which went on for a period of time. I was thinking about him last night. I was walking in the street when I suddenly fell over. We can use the Present Perfect when we want to look back from the present to the past. I’ve broken my watch so I don’t know what time it is. Have you ever been to Argentina? We can use the Past Perfect to talk about what happened before a point in the past. It looks back from a point in the past to further in the past. I hadn’t known the bad news when I spoke to him. I thought we had already decided on a name of this project. Раскройте скобки, поставив глагол в нужное прошедшее время. One day last year, my father _________ (drive) my brother and me to the amusement park. We _______________ (not be) there before. We _______________ (spend) all day going on different rides. We ______________ (keep) the best ride till the end of the day. Next to the ride there ___________ (be) a sign which __________ (say) “Empty your pockets”. My father __________ (not take) any notice of it. While we ___________ (ride) up and down, his wallet and his car keys ______________ (fall) of his pockets. We ______________ (look for) the car keys when our friends _______ (come) along. We ___________ (not find) the keys so our friends _________ (give a lift) home. Then they took my father to the amusement park with the spare keys! Афанасьева О.В. Серия «Новый курс английского языка для российских школ». 5 класс. – М: Дрофа, 2008. Фомина И.Н., Фомина Л.В. Английский язык в алгоритмах. – Днепропетровск, 2007. Пахотин А. Всё о модальных глаголах и сослагательном наклонении в английском языке. – М: Издатель Карева, 2005. Дубровин М.И. Иллюстрированный путеводитель по английской грамматике. – М: «Начала-Пресс», 1992. Упр. 241 Голицынский Ю. Грамматика: Сб. упражнений. – 7-е изд., – СПб. : КАРО, 2011. – С. 196. Упр. 242 Голицынский Ю. Грамматика: Сб. упражнений. – 7-е изд., – СПб. : КАРО, 2011. – С. 197. Напишите рассказ, начиная с “One day, while I was walking along the city center…” и используя все прошедшие времена.